ASP.NET Identity is an extensible system which enables you to create your own storage provider and plug it into your application without re-working the application. This topic describes how to create a customized storage provider for ASP.NET Identity. It covers the important concepts for creating your own storage provider, but it is not step-by-step walkthrough of implementing a custom storage provider. For an example of implementing a custom storage provider, see Implementing a Custom MySQL ASP.NET Identity Storage Provider. This topic was updated for ASP.NET Identity 2.0. By default, the ASP.NET Identity system stores user information in a SQL Server database, and uses Entity Framework Code First to create the database. For many applications, this approach works well. However, you may prefer to use a different type of persistence mechanism, such as Azure Table Storage, or you may already have database tables with a very different structure than the default implementation. In either case, you can write a customized provider for your storage mechanism and plug that provider into your application. ASP.NET Identity is included by default in many of the Visual Studio 2013 templates. You can get updates to ASP.NET Identity through Microsoft AspNet Identity EntityFramework NuGet package. ASP.NET Identity consists of classes called managers and stores. Managers are high-level classes which an application developer uses to perform operations, such as creating a user, in the ASP.NET Identity system. Stores are lower-level classes that specify how entities, such as users and roles, are persisted. Stores are closely coupled with the persistence mechanism, but managers are decoupled from stores which means you can replace the persistence mechanism without disrupting the entire application. The following diagram shows how your web application interacts with the managers, and stores interact with the data access layer. 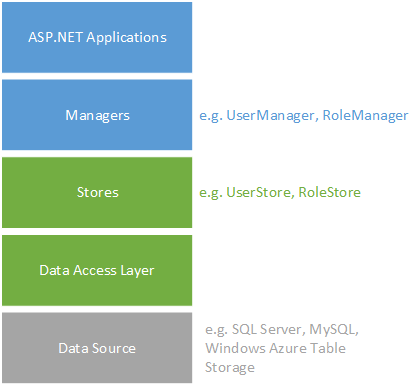 To create a customized storage provider for ASP.NET Identity, you have to create the data source, the data access layer, and the store classes that interact with this data access layer. You can continue using the same manager APIs to perform data operations on the user but now that data is saved to a different storage system. You do not need to customize the manager classes because when creating a new instance of UserManager or RoleManager you provide the type of the user class and pass an instance of the store class as an argument. This approach enables you to plug your customized classes into the existing structure. You will see how to instantiate UserManager and RoleManager with your customized store classes in the section Reconfigure application to use new storage provider. To implement a custom storage provider, you must understand the types of data used with ASP.NET Identity, and decide which features are relevant to your application. Users Registered users of your web site. Includes the user Id and user name. Might include a hashed password if users log in with credentials that are specific to your site (rather than using credentials from an external site like Facebook), and security stamp to indicate whether anything has changed in the user credentials. Might also include email address, phone number, whether two factor authentication is enabled, the current number of failed logins, and whether an account has been locked. User Claims A set of statements (or claims) about the user that represent the user's identity. Can enable greater expression of the user's identity than can be achieved through roles. User Logins Information about the external authentication provider (like Facebook) to use when logging in a user. Roles Authorization groups for your site. Includes the role Id and role name (like "Admin" or "Employee"). This topic assumes you are familiar with the persistence mechanism that you are going to use and how to create entities for that mechanism. This topic does not provide details about how to create the repositories or data access classes; instead, it provides some suggestions about the design decisions you need to make when working with ASP.NET Identity. You have a lot of freedom when designing the repositories for a customized store provider. You only need to create repositories for features that you intend to use in your application. For example, if you are not using roles in your application, you do not need to create storage for roles or user roles. Your technology and existing infrastructure may require a structure that is very different from the default implementation of ASP.NET Identity. In your data access layer, you provide the logic to work with the structure of your repositories. For a MySQL implementation of data repositories for ASP.NET Identity 2.0, see MySQLIdentity.sql. In the data access layer, you provide the logic to save the data from ASP.NET Identity to your data source. The data access layer for your customized storage provider might include the following classes to store user and role information. Again, you only need to implement the classes that you intend to use in your application. In the data access classes, you provide code to perform data operations for your particular persistence mechanism. For example, within the MySQL implementation, the UserTable class contains a method to insert a new record into the Users database table. The variable named _database is an instance of the MySQLDatabase class. After creating your data access classes, you must create store classes that call the specific methods in the data access layer. The following diagram shows the IdentityUser class that you must create and the interface to implement in this class. The IUser<TKey> interface defines the properties that the UserManager attempts to call when performing requested operations. The interface contains two properties - Id and UserName. The IUser<TKey> interface enables you to specify the type of the key for the user through the generic TKey parameter. The type of the Id property matches the value of the TKey parameter. The Identity framework also provides the IUser interface (without the generic parameter) when you want to use a string value for the key. The IdentityUser class implements IUser and contains any additional properties or constructors for users on your web site. The following example shows an IdentityUser class that uses an integer for the key. The Id field is set to int to match the value of the generic parameter. For a complete implementation, see IdentityUser (MySQL). You also create a UserStore class that provides the methods for all data operations on the user. This class is equivalent to the UserStore<TUser> class in the Microsoft.ASP.NET.Identity.EntityFramework namespace. In your UserStore class, you implement the IUserStore<TUser, TKey> and any of the optional interfaces. You select which optional interfaces to implement based on the functionality you wish to provide in your application. The following image shows the UserStore class you must create and the relevant interfaces. The default project template in Visual Studio contains code that assumes many of the optional interfaces have been implemented in the user store. If you are using the default template with a customized user store, you must either implement optional interfaces in your user store or alter the template code to no longer call methods in the interfaces you have not implemented. 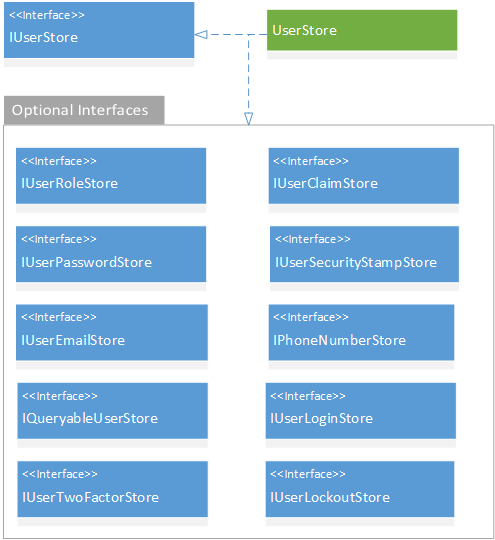 The following example shows a simple user store class. The TUser generic parameter takes the type of your user class which usually is the IdentityUser class you defined. The TKey generic parameter takes the type of your user key. In this example, the constructor that takes a parameter named database of type ExampleDatabase is only an illustration of how to pass in your data access class. For example, in the MySQL implementation, this constructor takes a parameter of type MySQLDatabase. Within your UserStore class, you use the data access classes that you created to perform operations. For example, in the MySQL implementation, the UserStore class has the CreateAsync method which uses an instance of UserTable to insert a new record. The Insert method on the userTable object is the same method that was shown in the previous section. The next image shows more details about the functionality defined in each interface. All of the optional interfaces inherit from IUserStore. The IUserStore<TUser, TKey> interface is the only interface you must implement in your user store. It defines methods for creating, updating, deleting, and retrieving users. 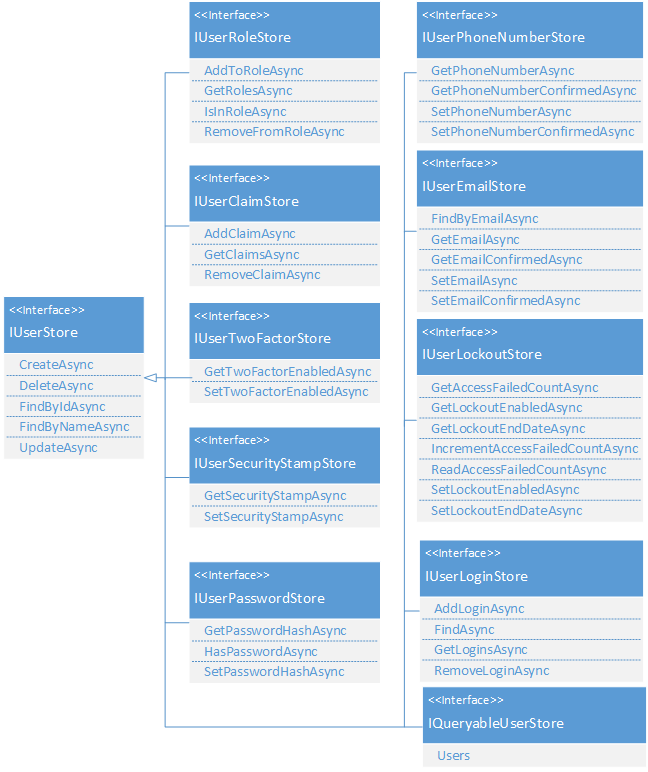 The IUserClaimStore<TUser, TKey> interface defines the methods you must implement in your user store to enable user claims. It contains methods or adding, removing and retrieving user claims. The IUserLoginStore<TUser, TKey> defines the methods you must implement in your user store to enable external authentication providers. It contains methods for adding, removing and retrieving user logins, and a method for retrieving a user based on the login information. The IUserRoleStore<TKey, TUser> interface defines the methods you must implement in your user store to map a user to a role. It contains methods to add, remove, and retrieve a user's roles, and a method to check if a user is assigned to a role. The IUserPasswordStore<TUser, TKey> interface defines the methods you must implement in your user store to persist hashed passwords. It contains methods for getting and setting the hashed password, and a method that indicates whether the user has set a password. The IUserSecurityStampStore<TUser, TKey> interface defines the methods you must implement in your user store to use a security stamp for indicating whether the user's account information has changed. This stamp is updated when a user changes the password, or adds or removes logins. It contains methods for getting and setting the security stamp. The IUserTwoFactorStore<TUser, TKey> interface defines the methods you must implement to implement two factor authentication. It contains methods for getting and setting whether two factor authentication is enabled for a user. The IUserPhoneNumberStore<TUser, TKey> interface defines the methods you must implement to store user phone numbers. It contains methods for getting and setting the phone number and whether the phone number is confirmed. The IUserEmailStore<TUser, TKey> interface defines the methods you must implement to store user email addresses. It contains methods for getting and setting the email address and whether the email is confirmed. The IUserLockoutStore<TUser, TKey> interface defines the methods you must implement to store information about locking an account. It contains methods for getting the current number of failed access attempts, getting and setting whether the account can be locked, getting and setting the lock out end date, incrementing the number of failed attempts, and resetting the number of failed attempts. The IQueryableUserStore<TUser, TKey> interface defines the members you must implement to provide a queryable user store. It contains a property that holds the queryable users. You implement the interfaces that are needed in your application; such as, the IUserClaimStore, IUserLoginStore, IUserRoleStore, IUserPasswordStore, and IUserSecurityStampStore interfaces as shown below. For a complete implementation (including all of interfaces), see UserStore (MySQL). The Microsoft.AspNet.Identity.EntityFramework namespace contains implementations of the IdentityUserClaim, IdentityUserLogin, and IdentityUserRole classes. If you are using these features, you may want to create your own versions of these classes and define the properties for your application. However, sometimes it is more efficient to not load these entities into memory when performing basic operations (such as adding or removing a user's claim). Instead, the backend store classes can execute these operations directly on the data source. For example, the UserStore.GetClaimsAsync() method can call the userClaimTable.FindByUserId(user.Id) method to execute a query on that table directly and return a list of claims. The following diagram shows the IdentityRole class that you must create and the interface to implement in this class. The IRole<TKey> interface defines the properties that the RoleManager attempts to call when performing requested operations. The interface contains two properties - Id and Name. The IRole<TKey> interface enables you to specify the type of the key for the role through the generic TKey parameter. The type of the Id property matches the value of the TKey parameter. The Identity framework also provides the IRole interface (without the generic parameter) when you want to use a string value for the key. The following example shows an IdentityRole class that uses an integer for the key. The Id field is set to int to match the value of the generic parameter. For a complete implementation, see IdentityRole (MySQL). You also create a RoleStore class that provides the methods for all data operations on roles. This class is equivalent to the RoleStore<TRole> class in the Microsoft.ASP.NET.Identity.EntityFramework namespace. In your RoleStore class, you implement the IRoleStore<TRole, TKey> and optionally the IQueryableRoleStore<TRole, TKey> interface. The following example shows a role store class. The TRole generic parameter takes the type of your role class which usually is the IdentityRole class you defined. The TKey generic parameter takes the type of your role key. 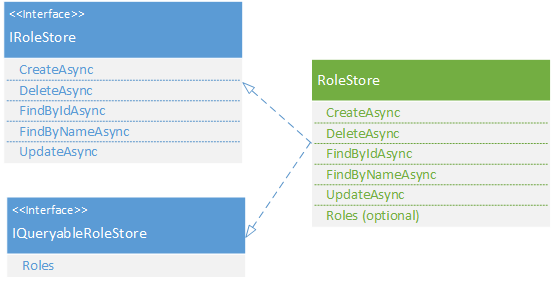 The IRoleStore interface defines the methods to implement in your role store class. It contains methods for creating, updating, deleting and retrieving roles. To customize RoleStore, create a class that implements the IRoleStore interface. You only have to implement this class if want to use roles on your system. The constructor that takes a parameter named database of type ExampleDatabase is only an illustration of how to pass in your data access class. For example, in the MySQL implementation, this constructor takes a parameter of type MySQLDatabase. For a complete implementation, see RoleStore (MySQL) . You have implemented your new storage provider. Now, you must configure your application to use this storage provider. If the default storage provider was included in your project, you must remove the default provider and replace it with your provider. In the Manage NuGet Packages window, uninstall the Microsoft ASP.NET Identity EntityFramework package. You can find this package by searching in the Installed packages for Identity.EntityFramework. You will be asked if you also want to uninstall Entity Framework. If you do not need it in other parts of your application, you can uninstall it. In the IdentityModels.cs file in the Models folder, delete or comment out the ApplicationUser and ApplicationDbContext classes. In an MVC application, you can delete the entire IdentityModels.cs file. In a Web Forms application, delete the two classes but make sure you keep the helper class that is also located in the IdentityModels.cs file. If your storage provider resides in a separate project, add a reference to it in your web application. Replace all references to using Microsoft.AspNet.Identity.EntityFramework; with a using statement for the namespace of your storage provider. In the Startup.Auth.cs class, change the ConfigureAuth method to use a single instance of the appropriate context. In the App_Start folder, open IdentityConfig.cs. In the ApplicationUserManager class, change the Create method to return a user manager that uses your customized user store. Replace all references to ApplicationUser with IdentityUser. The default project includes some members in user class which are not defined in the IUser interface; such as Email, PasswordHash, and GenerateUserIdentityAsync. If your user class does not have these members, you must either implement them or change the code that uses these members. If you have created any instances of RoleManager, change that code to use your new RoleStore class. The default project is designed for a user class that has a string value for the key. If your user class has a different type for the key (such as an integer), you must change the project to work with your type. See Change Primary Key for Users in ASP.NET Identity. If needed, add the connection string to the Web.config file.